These next few weeks are hectic! I am continuing with the competition prize plus making Christmas things. Because of the article out in America there have been enquiries and so lots of paperwork, emails and boring things that are part of business have had to be sorted!! I am not really complaining though, it's really lovely that people appreciate what work and products I am producing. Also I am meeting new people who are of the same mind about hand made items for gifts or for their own homes. 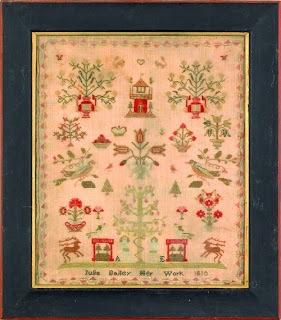 I will be showing you all pictures of the competition prize so far in a few days, when I get around to uploading some photos but until then, I thought, you would like to see some vintage samplers. I am lucky enough to own one antique sampler which hangs in my stair well but I was looking at pictures of some and they amaze me. Some are stitched by children. I know it was a way of teaching the ABC and numbers, but the stitching in some is just outstanding. Try and Google for pictures and see what you can find to marvel over. Its a great inspiration and a way of discovering different stitches to learn and practice as well. I get little scraps of vintage linen from pieces of work that I do, but they are never wasted. They go in a box and it is on these bits that I practice or do a 'dry run' of a design so I can see what it is like, before I have a costly mistake and have to unpick it ...... carefully. We grow old because we stop laughing! !